This regal compact set with bonus gift has things needed to transform playrooms into a royal dream come true. The princess takes a leisurely stroll on her private island, adorned with a vibrant rose arch and majestic swans. Enjoy a boat ride with the prince in the Gondola bonus set, which floats and can pull up along the princess island at the private dock. The compact set includes two figures, two swans and chicks, a bird bath, doves, roses and more. 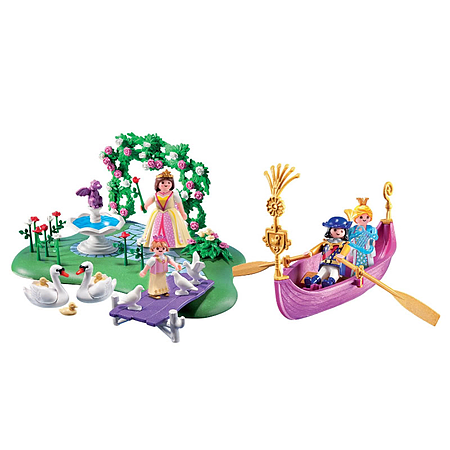 The bonus gift includes two figures, a floating gondola, harp and other accessories. The miniature worlds of Playmobil encourage children to explore and learn while having fun. Children's imaginations are transported to medieval times with the Playmobil Castle, to the adventurous seas with Playmobil Pirates and many other themed play worlds. The figures can bend, sit, stand and turn their heads to make realistic role play possible.